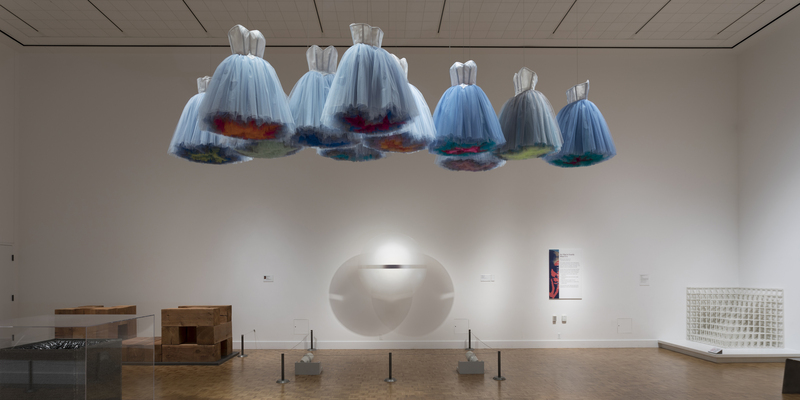 View of “Ruben & Isabel Toledo: Labor of Love,” 2018–19. Longtime couturier Isabel Toledo, who had the distinct honor of designing Michelle Obama’s 2009 inauguration outfit, and her husband, the illustrator, artist, and stage designer Ruben Toledo, have been collaborators for nearly forty years. The pair, based in Manhattan, have embarked on another singular adventure: a show commissioned by the Detroit Institute of Arts (DIA) for which the Toledos have created a new body of work that responds to the museum’s vast and extraordinary collection—which the duo talks about below. “Labor of Love” is on view through July 17, 2019. A COUPLE OF YEARS AGO, Vogue’s André Leon Talley brought us to the Detroit Institute of Arts to give a talk on fashion, style, art—you know, the whole shebang. Then, about a year later, Laurie Farrell, curator of the contemporary art galleries at DIA, asked us to do a show there. After giving her a very enthusiastic “Yes!,” we took a comprehensive, two-day tour of the museum and just fell in love with its collection. We were free to do whatever we wanted for the exhibition, but Laurie came up with the idea of us creating interventions throughout the museum, making works that reacted to variously themed galleries devoted to, for instance, the Italian Renaissance, ancient Egypt, early American art, and African art. We only had a year to create this expansive show—not a second to waste! But we’re used to this fast pace, as it’s very much how fashion operates. Isabel’s first impulse was to dress the museum. Literally. As a reaction not so much to specific artworks, but to the entirety of the space, including DIA’s history, its staff, its curators, and the visitors that pass through it all the time. Isabel approached DIA as a living entity. And then she started to notice certain patterns across cultures, across different periods, and to connect the dots—seeing the way an Oceanic statuette was posed in one gallery and then noticing that same pose repeated in an early American portrait in another gallery. All this historical work from the museum’s collection felt very instructional: Each era and culture, communicating across the centuries, had something to tell us, now, about how things were done, what ideas were valued—Isabel felt as though she was taking in a guide to civilization. A garment can speak to us in the same way, perhaps even more profoundly, as it deals with the body directly. The linen bandages used for mummification inspired our sculpture Human Remains. Linen holds shape beautifully because it’s an incredibly absorbent textile—it records the memory of a person’s shape quite well. The piece is a molded, linen body, without anything inside. You see the whole figure, and it’s collapsed in just the right way, giving it an uncanny presence, as if it were a freshly shed skin. Ruben tattooed it—similar to the way an Egyptian sarcophagus is painted and ornamented, telling us about the deceased and their journey into the hereafter. For Ruben, Diego Rivera’s famous Detroit Industry murals were his main focus and fuel. They are such a celebration of the choreography of work, of labor, of people combining their energies to achieve something great. In the murals, Diego took on race in an elemental, almost cosmic way—people are not “white” or “black” or “brown,” but essential components of a large, extremely diverse, and deeply creative life force. Don’t forget that immigrants built Detroit: Mexican, black, African, Canadian, French—the list is endless. Diego was also paying homage to work and industry, so much of which has left Detroit. And it’s not just there—people are losing jobs all over the world due to advancing technology and a fundamental disrespect for human efforts. It’s very sad. A working society is, after all, a healthy society. Take away the work, and people become disempowered. Everyone needs to feel useful—help their families put food on the table, keep a roof over their heads. We all want to have skills in order to enrich our collective history. Ruben paid tribute to the murals by painting on large, pleated linen canvases that absorb all of Diego’s ideas about life and culture, the past and the future. The series is called “Color Code.” You can peek into their folds and creases as much as you can, but you won’t get all the secrets and information Ruben planted in them unless they’re undone and the linen is completely stretched out. Like Diego, Ruben’s embedded commentary on the state of today in all kinds of stealthy ways, about how gender and race have been weaponized within contemporary culture. Through the power of camouflage, “Color Code” demonstrates how we can choose to hide in plain sight or distinguish ourselves, mark our territory. This theme is explored further in the “Social Commentary” series, which features Ruben’s satirical drawings alongside Diego’s. 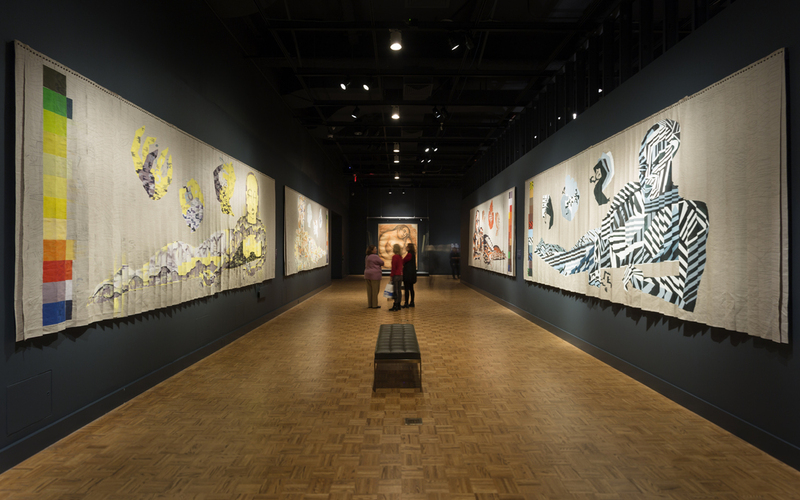 Our painting Dismantling Industry/Transitions speaks to the positive changes happening in Detroit and the different ways the city is utterly reinventing itself. Like any living organism, humanity has the power to incubate, morph, and be reborn into a new form. The citizens of Detroit are really committed to their city—their pride and attachment to it is beautiful, powerful. Sew Great Detroit is a part of all this love. It’s an extension of a nonprofit organization called Alternatives for Girls, a program that helps homeless and at-risk young women. Sew Great, which teaches these women how to sew—as a skill to make a living with or simply as something to benefit them personally and creatively—collaborated with us by developing a series of one-of-a-kind tote bags that have been painted on by Ruben. Black Cloud is another piece that was influenced by Diego’s murals. It’s made from Isabel’s first sewing machine, which she tailored from the inside out. Every single component—the screws, belts, plates, even the sewing needle—has been entombed in black paper taffeta. Coming out from the machine are these taffeta veins connected to these cloud-like couture puffs suspended from the ceiling, which are also made out of black paper taffeta. The work forces the viewer to gaze heavenward. It’s a mourning piece—the sewing machine wears a carefully created shroud that seeps into its interiors, wrapping itself around its organs. It’s a comment on the fashion industry’s disappearing workforce, the women and men who build individual garments—many of whom have skills that have been passed down to them from previous generations. The all-too-human and delicate fashion ecosystem will be forever lost with this new generation. Black Cloud is a testament to the end of one reality. But this only inspires us, as devoted dreamers, to create the next.